We study theoretically the transport properties of interacting electrons in quantum wires. Experimental realizations of these include: carbon nanotubes, nanowires made of semiconductor or metal materials, polymer nanowires, and edges of topologically nontrivial 2D materials. Our interests encompass a broad range of transport phenomena in which electron-electron interactions play an essential role. In particular, we study quantum wire circuits, transport through quantum dots and correlated 1D systems with impurities, and transport far from equilibrium. Some of the running projects are listed below. Multiterminal junctions and networks of nanowires have a rich phase diagram resulting from strong interaction-induced renormalizations of scattering processes. Devices like nanorings embedded in current-carrying structures reveal the interplay of the quantum interference and interactions. 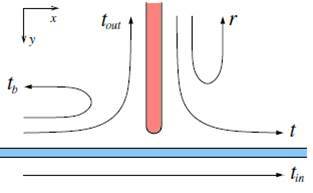 Schematic picture of scattering processes at the three-way junction of nanowires. Relaxation to thermal equilibrium is highly nontrivial in one dimesnion. In particular, energy relaxation is dramatically enhanced by the presence of impurities, boundaries, and other spatial inhomogeneities, phase relaxation crucially depends on the type of nonequilibrium, and many-particle collisions play a qualitative role in dissipation phenomena. 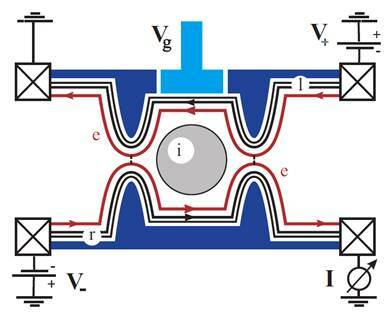 Scheme of the tunneling experiment in a voltage-biased quantum wire. Chiral edges in quantum Hall systems, when placed in close proximity to each other and allowing for exchange of electrons between themselves, represent a versatile quantum circuit to study the scattering processes and the quantum interference phenomena in one-dimensional geometry. Oppositely directed helical edges of a two-dimensional topological insulator in quantum spin Hall materials is another example of this type of nanowires. Scheme of the device used to study the quantum interference of quantum Hall edges backscattered at the quantum point contacts.